The DOWNLOADS user folder has been added to cleanmgr.exe in the latest Windows 10 October 2018 feature update (1809 version). 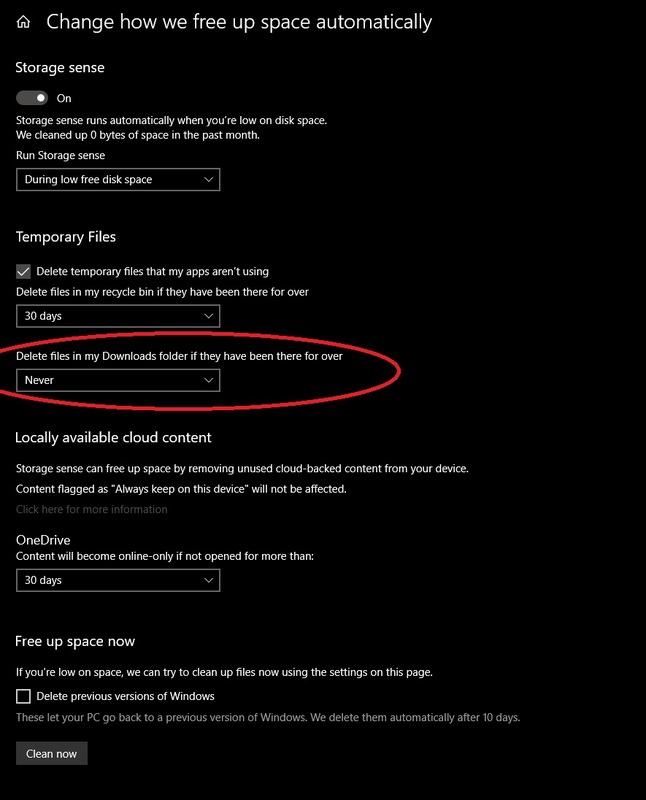 With this option checked it will delete all the files in the Download folder under the users folder. We have not confirmed if it is all users on the system or only the current user running the utility. 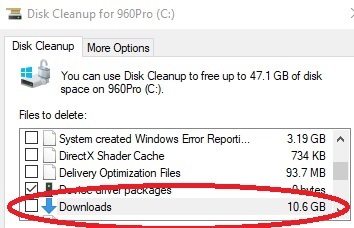 However everyone should be aware of this and be sure not to check that option if you manually run the Disk Cleanup utility. This option is not selected by default, but the majority of users who use this utility will go through and select everything because up until this point they have all been actual temporary file locations and items. NOT standard user folders! 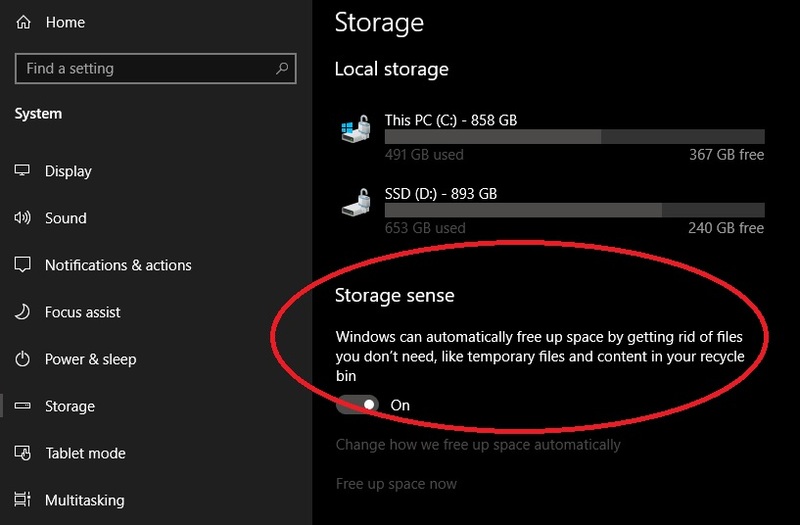 So it is not enabled by default in storage sense but the fact that they have it there at all is fairly concerning. I don’t think I know of any user who uses that as only temporary storage (ourselves included), especially since the default download location for almost all web browsers is the users Download folder. What does it mean for d7x? All versions prior to d7x 18.10.11 should not run d7x’s (or any version of d7II/d7) function “Run Windows CleanMgr.exe” on a Windows 10-1809+ system because the Downloads folder option is automatically included in that operation. d7x runs all options for cleanmgr unless it was coded to exclude a specific option, so d7x had to be updated to add this new option Microsoft added. You can read more about this in the d7x Release Notes for 18.10.11 here. What does it mean for CryptoPrevent? With the introduction of v9, CryptoPrevent is able to perform maintenance options. It does this utilizing d7x itself, so this must be updated as well. The current version 9.1.0.0 has a version of d7x that will perform the operation to delete the Downloads folder when Maintenance->Free Up Space->Run Windows cleanmgr.exe is selected. It is recommended to disable this option on any system that has Windows 10-1809 installed, until an updated CryptoPrevent version can be released. Since CryptoPrevent has been undergoing some major updates besides this some additional work and testing needs to be done before we can release an updated version with this fix included. We will be working around the clock to get an updated version out to you that we feel is stable and ready, but please be aware of this and disable this option in the meantime. 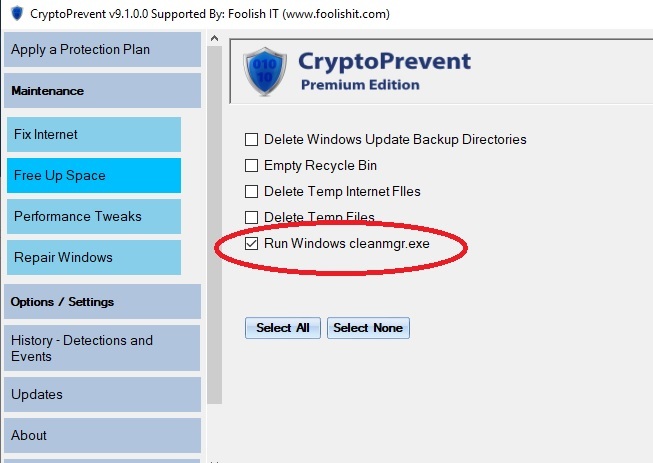 You can run the command line option of: CryptoPrevent.exe /RunWinCleanMgr=0 to disable this option if you have the premium version. Free versions will just need to ensure they do not have this option checked when they use the “Run Maintenance Now” button. What does it mean for dSupportSuite? Basically this issue is the same again for dSupportSuite’s client option. There is an updated release of the client, version 18.10.11. Be sure this version is pushed out to any of your client’s systems that may get or be upgraded to the latest Windows 10 1809 update or this option is disabled from performing automatically or as a button option in the client facing interface. Find more about the release notes for that version here.